Hyundai i30 | What Car? This is Hyundais new i30, which is designed to offer Ford Focus- and Volkswagen Golf-beating space, when it goes on sale in spring 2012. The latest i30 gets a new, longer chassis thats designed to free up cabin space. Hyundai has yet to announce precise dimensions, but the wheelbase has stretched slightly for the new generation. Luggage space has increased too, by around 10%. The new i30 also looks lower and wider than the car it replaces. The front end is particularly dramatic, with a low nose and Hyundais hexagonal grille stretched wider than ever before. At the rear theres a definite nod to the iconic Golf; the Hyundai boot badge pops up to reveal the reversing camera, just like the VWs. The cabin has a more stylish fascia, close in design to the i40s, plus higher-quality plastics. Theres also more widespread use of double-stitched leather: cleverly, Hyundai has applied this material to the hood above the instruments, directly in the drivers line of sight. Hyundai has yet to release engine details, final spec and pricing for the car, but we'd expect at least one of the diesel engines to dip beneath 100g/km of carbon dioxide. 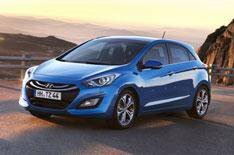 Although the i30 isnt likely to undercut its rivals on price, wed expect it to provide more standard kit.